Transcription and data visualization are both popular DHSS projects. Your students could do each task together or separately. A quick internet search can also identify other supports outside this Guide to support the work of transcription and data visualization. With transcription and data visualization, students would transcribe a piece of material and then would use data visualization or data analysis tools to demonstrate discursive patterns in the text. Easy to Moderate. The size and difficulty level of this assignment depends on the format and length of the original source. A handwritten letter, for example, would be more intensive work than a printed newspaper article. Robyn Le Lacheur did both transcription and data visualization as part of her exhibit “Looking Back: Temporal and spatial connections of Post-War migration and displacement through the eyes of the Toronto Telegram.” However, each task could be enough for one assignment if framed differently. Robyn did both transcription and data visualization because part of her task was finding the source and making it presentable on a website. 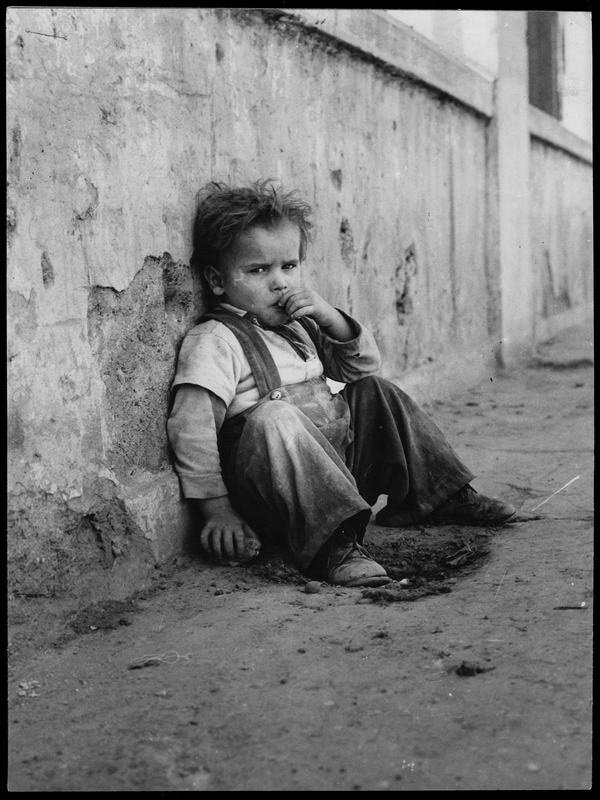 Robyn’s focus for her project was on the images from the Toronto Telegram filed under “refugee.” Working so closely with these images got Robyn interested in seeing how the images were actually used in the newspaper. So, to explore this more closely, she chose one photograph, did a library search to find the article that used that photograph, and found the article on microfilm. She then saved the article in a digital format and “cleaned” it for “noise” so it could be posted on-line. 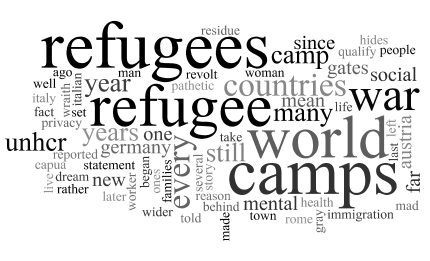 After this work, she then transcribed the article – deciding if she should keep the same line breaks or just type it with standard margins in Word – and put the text through a word cloud generator. Robyn playing with different tools for the visualization, including Voyant an easy and very user friendly data analysis tool, before she settled on WordCloud because she liked how she could customize the words that could be featured. The result of Robyn’s work is that now Ron Poulton’s 1964 article “Their War Goes On: Opulence Hides Gray Refugees” is available online and situated in a larger exhibit and discussion about post-war migration and displacement through the eyes of the Toronto Telegram. 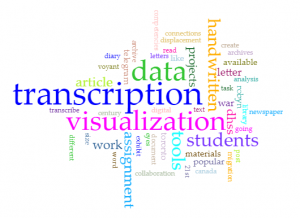 As mentioned, both transcription and data visualization are popular DHSS activities. Transcription is a popular DHSS method for history because of the value in transcribing handwritten documents. Data visualization is a popular DHSS method in literature or political science because of the ways in which the tools help identify discursive patterns that may not be as visible by traditional reading. When framing transcription and data visualization with 21st-century competencies like critical thinking, communication, collaboration, and creativity and innovation as found by the Ontario government’s international review of 21st-century competencies, each task can be transformed to have your students think about the role they are playing in developing space for greater access to materials and thus the responsibilities they hold when creating, organizing, and/or presenting materials to the public (similar ideas are discussed in the Metadata assignment). To think about the scale of this assignment for your students, ask yourself organizational questions such as: will students use a document from an already organized and digitized corpus like The Globe and Mail archive, or will they have to find something on their own using microfilm like Robyn did, which will then need to be digitally edited for the web? Will they have to find materials by going to an archive and working with an archivist? Will the original material be typed (like a newspaper article or broadsheet) or will they be handwritten, and if they are handwritten (like a letter), has enough support been given to students to read and understand it? Note: it’s not that young people “don’t know how to read handwriting,” it’s just that handwriting is hard to read. They should be supported in their efforts. In Dr. Mary Chaktsiris’s course “Digital Humanities: Digital Editing and Publishing” for Wilfrid Laurier University, she got her students to “crowdsource” the transcription of 19th-century handwritten letters by projecting the letters in class and inviting students to transcribe each letter together. This activity encouraged both collaboration and discussion about the words in the letter and context in which they were written. Doing this work as a class also destigmatized any difficulties students may have had in reading the letters on their own. To support collaborative transcription projects, Library and Archives Canada has provided transcription guidelines for their digitization and transcription projects. These may be good inspiration in your own classroom. Transcription and Data Visualization by Samantha Cutrara, PhD, for the Office of the Vice Provost Academic, York University is licensed under a Creative Commons Attribution-NonCommercial-NoDerivatives 4.0 International License, except where otherwise noted.